This week city officials will start getting public comments on yet another plan for Rochester's future. 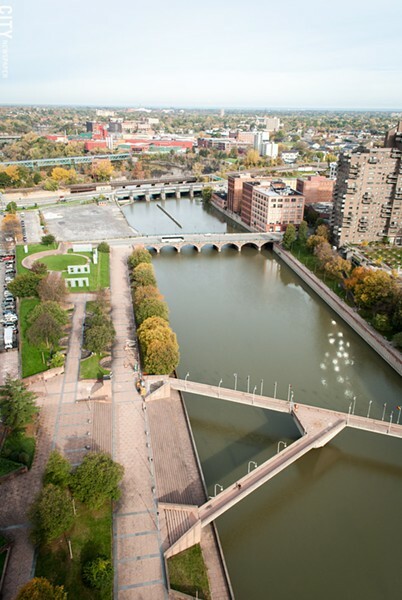 Called ROC the Riverway, it's a vast, detailed plan full of ideas to give the public better access to the Genesee River as it passes through downtown Rochester – and to capitalize on the river as a unique resource. The view of the Genesee River downtown, from the top of the First Federal Building. This isn't the first plan the city has come up with focused on the river, but it's the most extensive one I can remember. And to call it "bold" would be an understatement. The public cost itself – $500 million – pretty much takes your breath away. But money aside, for the most part it's not unrealistic. If we can afford it – or at least its key parts – it could be a really important way to boost economic development, to make Rochester a magnet for new residents and new businesses. It's a much better economic development idea than, say, a casino. If you care about the city, try to attend one of the public meetings, the first of which is on Thursday (4 to 6 p.m. at the Monroe Community College downtown campus). Stay informed about the plan as it progresses and gets refined, and plan to share your thoughts with city officials. There'll be plenty of skeptics, some of them the usual gloomy Rochester critics. I've done my own eyebrow raising as I looked through the plan. A pedestrian bridge across the top of the High Falls? Seriously? Maybe I'll be convinced about that, though. And there's plenty to applaud about ROC the Riverway, beyond its comprehensive approach to capitalizing on the river in very creative ways. Especially noteworthy is the attention paid to areas of the city that are often ignored in Grand Plans. 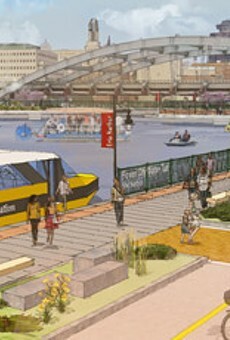 At the southwestern end, the plan calls for enhancing public riverfront land near the PLEX neighborhood. At the northeastern end, it calls for a variety of passive and active recreation spaces – and it proposes making the connection between downtown and Rochester's close-in northeast neighborhood much more open and attractive. Trails, bridges, parks: all good stuff. They're the kinds of things other cities have used to improve their quality of life. And they're the kinds of things that city residents of all kinds want – including the young professionals that Rochester hopes to attract. Two concerns, though. One, of course, is that $500 million cost. Not all of it will have to come from the city (the state has already pledged $50 million), but whatever the sources, city officials will have to be sure that spending the public's money will be a good investment. Another: The population of this region isn't growing appreciably. Nearly all of the new folks moving into downtown are moving from somewhere nearby. Things like new parks and the ability to bike for miles along the river will help make downtown a more interesting, fun place to live and work. But at the same time the city is creating those things, our suburbs will be creating new parks, new recreation facilities, new housing. This region's sprawl and inter-municipal sibling competition is wasteful, and it has held us back. But it's not going away. And the folks analyzing ROC the Riverway will have to keep that in mind. Every bit as important: the "new city" that ROC the Riverway spawns has to be a city for everybody. One of the goals of this plan is to generate millions of dollars of new private investment. That investment can't be simply for the well-to-do. It can't exacerbate the affordable-housing shortage, which is already a serious problem in Rochester. I like ROC the Riverway. I like its creativity, and its enthusiasm. And I like its goal of making the river more accessible. There are ways to do it right. I think city officials want it done right. That can happen if the right protections are built in at the start. Trails and bridges and islands and more: City Hall rolls out a bold plan to revitalize the riverfront.